American eaters, they’re like a pack of animals, hustling dinner in 10 minutes or less. It sounds like a recent complaint, but in fact it comes from 1864, when the Englishman John Francis Campbell was startled at the rapidity with which fellow steamboat passengers consumed their meals as they floated down the Ohio River. They were quick as foxhounds over their food, he marveled. Because service was family style, you risked leaving the table hungry if you failed to keep up. And Campbell wasn’t sure this speed was such a good thing. As this anecdote suggests, Americans’ affinity for hurried consumption—along with plenty of criticism for this tendency—go back a long way, at least as far back as when Campbell and his fellow passengers were journeying. The steady pursuit of efficiency, which informed new methods of travel, agriculture, and manufacturing, also informed American eating and has indelibly molded the modern American meal. The trend was pervasive in the 19th century, when European travelers often wrote amusingly of the swiftness with which Americans “dispatched” their food. They referred to meals at hotels as being “swallowed” or “gone through.” An Englishman at a hotel in Washington noted that boarders breakfasted in five minutes, while another Englishman, having learned the American way, recorded that he proudly rushed to the table to contribute his “strenuous efforts to the work of destruction”—that is, the destruction of several dishes, if not also of his digestion. Why did 19th-century Americans have a penchant for hustling their meals? Most of the Europeans who commented on our gustatory speed failed to tender an explanation, though one observer accounted for it simply as “part of the go-ahead character of the people.” It was true: Americans were on the go, especially come the Industrial Revolution, which drove the growth of cities and changed the nature of work for a broad swath of the population. When factory clocks began to replace agricultural rhythms, meals underwent a thorough re-organization and deep transformation. Workers in cities could no longer return home for a midday meal because of the increasing distance between work and home and the decreasing amount of time allotted for a midday recess. So dinner shifted to the evening, and a new meal emerged to fill the void: lunch. The idea here was a glorified snack, a stop-gap between breakfast and dinner. Cold food was quick food, so it fit the bill, as did handheld items such as sandwiches, which didn’t require cooking, cleanup, or the use of utensils. If you wanted soup or hash or a slice of pie, you could visit one of the new cafeteria-style restaurants called quick lunches—pioneers of food service efficiency. 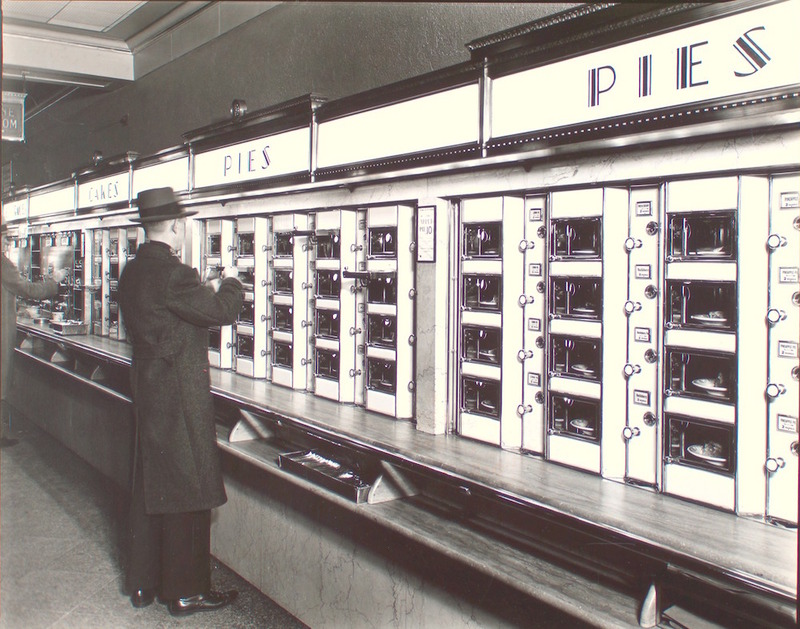 From the one-arm joint (where you sat at a one-person table and didn’t have to waste time in conversation) to the automat (where you acquired food from a kind of giant vending machine and didn’t have to deal with wait staff or a cashier), fast food options of the late 19th and early 20th centuries abounded. They saved you time, and time was money. Alternatively, some office workers chose to avoid the hassle of the quick lunch by eating a light meal from home at their desks. In 1904, Good Housekeeping profiled one such luncher who, complaining that his mind did not work as clearly for the first hour or two after a hot midday dinner, had shifted from restaurant meals to a sandwich prepared by his wife. “After eating in my office,” he explained, “I have a quiet hour to work without being bothered by the clamorous clients that infest a down-town law office at all other hours of the day.” For him, lunching light and alone meant both productivity and peace. Companies knew that time was money, and executives began to worry that quick lunch restaurants might cause workers to become sluggish from indigestion, reducing their productivity and compromising their profitability. Cold lunches brought from home also came under criticism because the science of the day found warm food to be more easily digested. “Neither dinner pail nor quick lunch … sends employees back to work in the afternoon with anything like the spirit with which they came in the morning,” noted Elmer Henry Fish in his 1920 managerial text, How To Manage Men. The solution was company lunchrooms that did more than serve free coffee (though that was a start); they also offered a selection of hot items at or near cost. These would fuel workers appropriately while keeping them on the premises, sparing them the stresses of undue hurry. Breakfast underwent a similar transformation, turning lighter and quicker in the mid- to late 19th century—and efficiency became its hallmark. When reformers such as Sylvester Graham and William Andrus Alcott started promoting bread made from unbolted flour along with vegetarianism as a panacea for all manner of bodily ills, their primary aim was to improve Americans’ failing health—especially of the digestive sort. But the new, lighter, grain-based breakfast they promoted also happened to feed Americans’ desire for convenience, and convenience oiled the engines of profit. John Harvey Kellogg of Corn Flakes fame invented a product he baptized Granola, his first cereal, not just to find a novel way of serving whole wheat at his sanitarium, but also to save time. “It was very difficult to prepare cereals,” he noted, looking back on his busy medical school life in New York City, where he had rented a small third-story room. “It should be possible to purchase cereals at groceries already cooked and ready to eat.” Instant cereal was the answer—you just added milk. Toast became a convenience food when sliced bread and pop-up toasters appeared on the scene, and it fit perfectly into the new breakfast model, upholding the twin pillars of convenience and health. While a traditional farmer’s breakfast demanded precious time and was likely to overtax the desk-worker’s digestive powers, ultimately reducing his output, cereal and toast saved time and kept your body fit for sedentary tasks. The American pursuit of efficiency continues to shape our meals today, especially breakfast and lunch. Take, for example, the decline of Kellogg’s. Breakfast cereal was once a godsend for busy mothers, but now, as Devin Leonard reports in Bloomberg Businessweek, “Many people grab something on the way to work and devour it in their cars or at their desks while checking e-mail.” Fast food breakfast sandwiches, single-serving yogurts, smoothies-to-go, and individually wrapped breakfast bars are taking the place of cereal and toast, and as they do, the drive for convenience carves the morning meal into an even more mobile, snack-like, and efficient eating occasion. Given our increasing interest in grazing, lunch is also looking less like a meal and more like a snack. While many people who are disillusioned with the modern food system and our fragmented relationship with food are calling for a return to the art of the traditional meal, convenience continues to shape the way we eat. Perhaps this is because work has always shaped the way we eat, and what better way to make good on one’s time than to skip the hassle of meals altogether and simply fortify oneself with snacks? Or so the logic goes. In the 1830s, the Frenchman Alexis de Tocqueville noted the “feverish ardor” with which Americans seek to improve their well-being, and in this pursuit, he remarked, “they show themselves constantly tormented by a vague fear of not having chosen the shortest route.” Arguably, when it comes to eating, snacks and snack-like meals are “the shortest route.” In the era of industrialization, ideas about efficiency not only transformed the way we travel, work, farm, and manufacture, but also the way we eat. We Americans are still making our gustatory decisions with efficiency in mind. 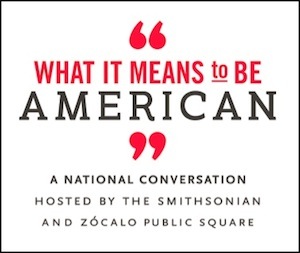 Abigail Carroll is the author of Three Squares: The Invention of the American Meal (2013). She has taught at Boston University, and she lives and writes in Vermont. *Photo courtesy of The Miriam and Ira D. Wallach Division of Art, Prints and Photographs: Photography Collection.